We recently spoke with RAPs member Paula Chandler as she embarked on The Great North Swim to find out a bit more about her career journey, why she wanted to join RAPs , and her involvement in The Great North Swim. I became interested in swimming back in 2001. It was my daughter’s Swimming Teacher, Judith Goodwin, who suggested that I should do my Swimming Qualifications. As soon as I had completed my Level 1 qualification she offered me a job working with her at Holmes Place Gym in Didsbury. In 2005 I decided to do my level 2. Since then I have always been involved in Swimming, either teaching or timekeeping or judging at local galas for Trafford Metro Borough Swimming Club where both my daughters swim. In 2009 I myself took up swimming, an adult class for parents and tri athletes that did not want to compete in the Masters Section of the Club was created. I took on the administration role liaising with new members and before we knew it our section of the club had grown to over 40 members. I have made many great friends through swimming and we have, as a group, participated in many Great North and Salford swims. We are so fortunate to have these on our doorstep. Windermere this year has been the warmest so far I just loved taking part in such a big event with a wide variety of swimmers having a great time. I would be lying if I said I wasn’t a little nervous. Once I’ve got the start out of the way, and relax into my stroke I enjoyed the view and the atmosphere of such a great event. I am the swimming teacher at St Ambrose College for Boys in Hale Barnes, we have a total new build with a new swimming pool, which is amazing. All boys in year 7 and 8 together with GCSE PE pupils have a time tabled swimming lesson. The whole school has an opportunity to swim lunchtimes or after school. We offer a variety of pool activities from improver/beginner classes, early morning teacher, squad training and water polo coaching. Rugby teams have swimming and circuit sessions in the pool to build their stamina. We have had many swimming galas where we have hosted most of them and all the visiting schools have been amazed at the facilities our boys have within the school. I have recently introduced, for the braver boys, open water swimming at Salford Quays on Wednesday nights. They have really been enjoying the open water experience. The boys love to hear what the teachers have been achieving in the pool and now open water swimming, as this year I managed to persuade 4 more teachers to join me at Windermere along with 11 of my Trafford Metro club swimmers. 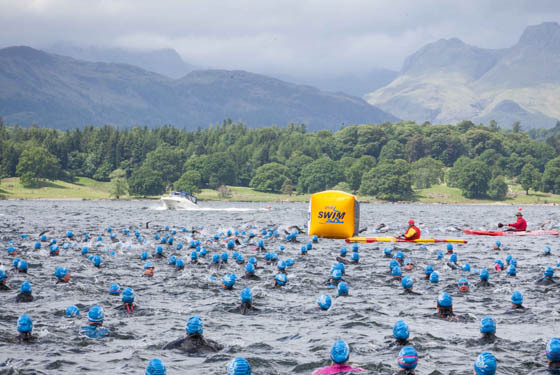 We all had such a great day at Windermere that over 20 friends have now booked for the Great Salford Swim in July, including both my daughters, Danielle and Emilie. Danielle is a swimming teacher and coach while studying primary educations at MMU. We both teach together at LA Fitness. Emilie is now 16 and is looking forward to doing her level 1 in July. RAPs is important as it will ensure that all swimming teachers and coaches are all qualified to a high standard, and we will all receive ongoing professional development. This is very important for teachers like myself as we can ensure that we are maintaining our professional knowledge and skills that we have already achieved, whilst continuing our personal development. RAPs will ensure that all swimming professionals are under one organisation.